A first Bank customer by the name Ikuomola Toluwalase took to Twitter via his handle @Iam_ernestok on 17th of October 2016 to accuse the prestigious bank of having scammed him of 226 thousand naira and left him with the statement, "there's nothing we can do about it". He narrated how he had lost his ATM card on and had contacted the bank to block it which the bank had failed to do and after six days he noticed that his money had been tampered with. 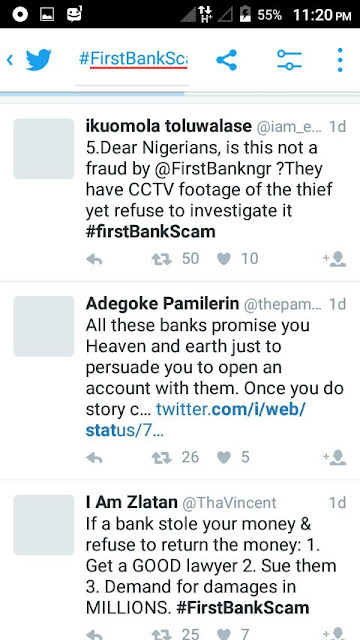 He mentioned that he has made a police statement and has taken steps to sue the bank. 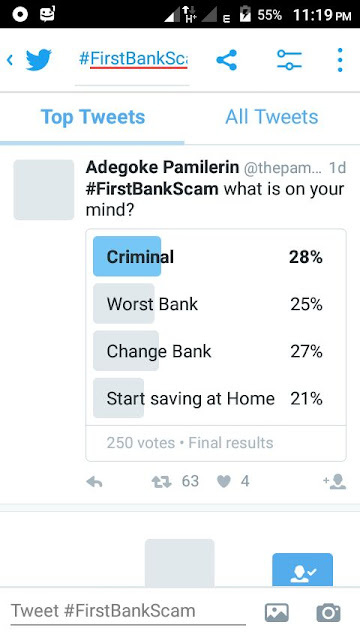 This caused an uproar on the Twitter as the hash tag #firstBankScam trended for about 11 hours with people airing their disapproval over the incident.